List of All New Features in C# 6.0: Part 12/27/2019 11:54:49 PM. In this article, you will learn new features of C# 6.0 in Visual Studio 2015 Preview, with examples. String Interpolation In C# 6.01/28/2019 9:23:08 PM. In this article we will learn how to concatenate/interpolate strings with C# 6.0. Getting Started With C# 6.0 New Features7/12/2016 10:12:27 AM. In this article, I am going to explain the most focused syntactical improvement which has been done in C# 6.0. ASP.NET Core Real Power: Features And Benefits2/23/2016 2:15:31 PM. In this article I am going to explain about ASP.NET Core real power and its benefits. We will also compare new features and enhancements with existing ASP.NET. String Interpolation In C# 6.01/12/2016 9:19:11 AM. In this article you will learn about String Interpolation in C# 6.0. How To Enable C# 6.0 / VB 14 In Visual Studio1/7/2016 11:03:09 AM. In this article we will learn how to enable C# 6 / VB 14 settings in Visual Studio. C# 6.0 String Interpolation11/30/2015 9:16:42 AM. In this article you will learn about C# 6.0 String Interpolation. Compiling C# 6.0 Code Using Roslyn Microsoft.CodeAnalysis v1.0.010/24/2015 10:03:07 AM. In this article you will learn how to compile C# 6.0 code using Roslyn Microsoft.CodeAnalysis v1.0.0. Elvis To Rescue From "Object Reference Not Set To An Instance Of An Object"10/22/2015 7:40:41 AM. The article is about using Elvis operator which is introduced in C# 6.0. It gives an example of how to use it. C# 6.0 String Interpolation10/7/2015 6:13:23 AM. In this article you will learn new string interpolation features in C# 6.0. Magic String Dilemma And C# 6.09/16/2015 12:18:40 PM. In this article you will learn about Magic String Dilemma and C# 6.0. Using Directive With Keyword Static in C# 6.09/2/2015 6:56:04 AM. In this article you will learn how to use directive with Keyword Static in C# 6.0. NullCheck with C# 6.08/23/2015 11:01:51 PM. In this article you will learn how to use NullCheck With C# 6. Latest C# 6.0 Features in RTM VS20158/11/2015 2:45:51 PM. In this article you will learn the latest C# 6.0 features in RTM VS2015. List of All New Features in C# 6.0: Part 26/26/2015 8:41:39 AM. In this article you will learn new features in C# 6.0. C# 6.0 Features6/5/2015 1:32:09 PM. This article describes C# 6.0 features with examples. See What's New in C# 6 and Visual Studio 20155/28/2015 10:05:27 PM. This article introduces the new features of C# 6 and Visual Studio 2015. Primary Constructors of C# 6.05/26/2015 1:04:08 AM. This video provides a clear explanation of PRIMARY CONSTRUCTORS of C# 6.0 with a demo which helps in understanding the PRIMARY CONSTRUCTORS of C# 6.0 within 8 mins. PRIMARY CONSTRUCTORS allows us to define a constructor for a type and capture the constructor parameters to use in initialization expression throughout the rest of the type definition. Auto Property Initializers of C# 6.05/21/2015 6:33:47 AM. In this video I have explained about the new feature of C# 6.0 Auto Property Initializers with a proper demo. Using explicit constructors while using primary constructors in C# 6.05/20/2015 12:50:29 AM. In this Video I have explained how to define an explicit constructor while defining a class with the support of primary constructors in C# 6.0. Property Initializers in C# 6.04/18/2015 1:31:22 PM. In C# 6.0 a new feature Automatic property was introduced. Some New Features in C# 6.04/10/2015 1:12:04 PM. In this article we will learn some new features in C# 6.0. Version History of C#3/3/2015 2:34:42 PM. In this article you will learn about the various versions of the C# language. Using Static Class Statements: A New Feature of C# 6.02/5/2015 7:40:57 AM. In this article we will learn about the new features of C# 6.0 Using Static Class Statements. Auto Property Initializer: A New Feature of C# 6.02/3/2015 7:36:17 AM. In this article we will learn a new feature of C# 6.0, Auto Property Initializer. String Interpolation: A New Feature of C# 6.01/30/2015 7:48:01 AM. In this article you will learn about the new features of C# 6.0 String Interpolation. Exception Filtering: A New Feature of C# 6.01/27/2015 5:06:31 AM. In this article you will learn the new feature of C# 6.0, Exception Filtering. Debugging and Diagnostics Enhancements in Visual Studio 20151/25/2015 8:40:57 PM. In this article you will learn Debugging and Diagnostics Enhancements in Visual studio 2015. Null Propagation Operator: A New Feature of C# 6.01/22/2015 7:37:11 PM. In this article we will learn about the new feature of C# 6.0, the Null Propagation Operator. Expression Bodied Members: A New Feature of C# 6.01/21/2015 2:56:48 AM. In this article we will learn about the new feature of C# 6.0, Expression Bodied Members. Using Await in Catch and Finally Blocks: A New Feature of C# 6.01/14/2015 3:01:16 AM. In this article we will learn about the new features of C# 6.0, await in catch and finally blocks. Dictionary Initializers: A New Feature of C# 6.01/13/2015 12:02:40 AM. 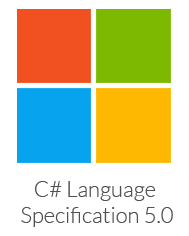 In this article we will learn about the new features of C# 6.0 Dictionary Initializers. Expression-bodied Function Members in C# 6.01/7/2015 3:42:50 PM. This article describes a new feature of C# 6.0 using Visual Studio Ultimate 2015 Preview. Easy to Access Static Methods in C# 6.01/7/2015 4:22:23 AM. This article explains a new feature of C# 6.0 using Visual Studio Ultimate 2015 Preview. Params Keyword With ienumerable in C# 6.01/6/2015 11:33:41 PM. This article explains the params keyword and its use with ienumerable in C# 6.0. Easy String Interpolation in C# 6.01/6/2015 8:42:06 PM. In this article I will learn a new feature of C# 6.0 with the help of Visual Studio Ultimate 2015 Preview. Expression Bodied Functions and Properties in C# 6.01/5/2015 4:07:58 PM. In this article, I will provide information about Expression Bodied Functions and Properties including how they work. Initializers For Auto-properties in C# 6.01/1/2015 10:58:45 PM. In this article I will learn a new feature of C# 6.0 with the help of Visual Studio Ultimate 2015 Preview. Getter Only Auto-properties in C# 6.01/1/2015 7:20:06 PM. This article explains a new feature of C# 6.0 with the help of Visual Studio Ultimate 2015 Preview. Dictionary Initializers: A New Feature of C# 6.012/10/2014 8:07:32 PM. This article explains the new way to initialize Dictionary objects in C# 6.0. Exception Filter in C# 6.012/9/2014 5:15:58 PM. Exception Filter is a new feature of C# 6.0 through which we can use some specified condition with each catch block. New Feature of C# 6.0: Nameof Operator12/9/2014 1:08:16 AM. In this article we will learn about the nameof operator, one of the new features of C# 6.0. Parameterless Constructors in Structure C# 6.012/8/2014 11:53:46 PM. This article tells about the introduction of Parameterless Constructors in structs in the newer release of features of the C# 6.0 version. How to Use Await and Async Keywords Within Catch and Finally Block in C# 6.012/4/2014 6:41:41 PM. In this article you will learn how to use await and async keywords in catch and finally blocks in C# 6.0. Property Initializers in C# 6.011/18/2014 1:53:32 PM. In this article you will learn about Property Initializers in C# 6.0 . Exception Filters in C# 6.011/18/2014 1:04:19 PM. In this article you will learn about Exception filters in C# 6.0. Getting Started With C# 6.011/17/2014 11:52:52 AM. In this article you will learn about new features of C# 6.0.